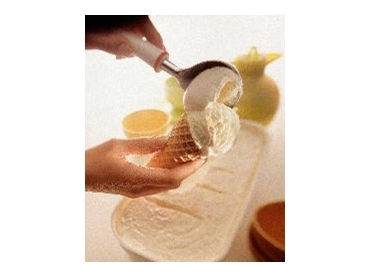 Using Danisco’s CREMODAN ICEPRO can produce a smooth ice cream, unaffected by heatshock. THE number one enemy of ice cream worldwide is heatshock, the irreversible change to ice crystals that occurs during storage and shipping. A freshly produced ice cream can very easily lose its appeal if the texture becomes coarse and icy. The problem is the growth of ice crystals during prolonged storage and during periods of temperature fluctuations. Danisco scientists have now developed a revolutionary range of functional systems, CREMODAN ICEPRO, to counteract this problem. The result is a smooth, creamy ice cream that maintains quality throughout its storage. CREMODAN ICEPRO also provides a number of additional production benefits. Manufacturers can safeguard the high quality of their ice cream by maintaining very small ice crystals during processing and into distribution and storage. Production benefits of CREMODAN ICEPRO include the ability to produce creamy, fresh-eating ice cream with conventional equipment. Ice cream made with CREMODAN ICEPRO has a high tolerance to imperfect hardening conditions and adverse storage conditions. Formulations can easily be modified to reduce protein and fat levels without loss of quality.